Except, well, we’re not back. I’ve been working on a big project that’s been taking all of my time and energy, which unfortunately has left little time to fulfill my duties here at Mission Control. But the good news is that this project is of such utter awesomeness that when I get to tell you about it, I think you’ll understand. That’s all I can say about it for now. Meanwhile, I’ll still be posting to the blog about goings on here at Mission Control, as well as some sketches and things. And I’ll let you all know what’s up as soon as I can. And I promise that Ellie, Jeff, and Muffin will be back! Thanks to all of you who have been reading for the past three and a half years! Have a great 2014! Sounds intriguing… and exciting! Happy New Year to you, Jim! Thanks, Wouter! And to you too. I promise, it’s intriguing! Happy New Year to you Jim and all your staff at Strang!!! Thanks, John! Everyone here at the Institute thanks you! welcome back! AND dang it all. At least we know you’re out there, somewhere, and staying in touch. Three and a half years? How time flies! 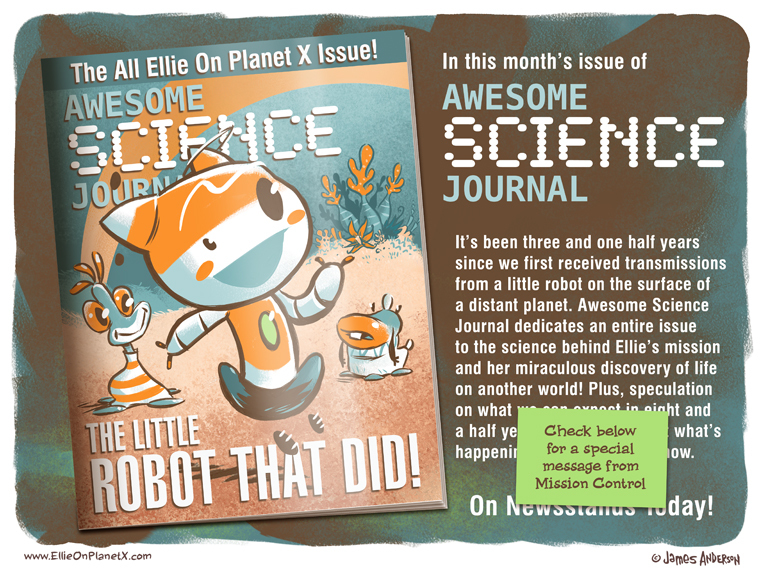 Where can I buy that Awesome Science Journal? Is there any way to say that without sounding awesome? Man, you really need a guest cartoonist for next time. Next time I will! But did you happen to see what I’ve been up to?